We knew Sherlock had survived the fall, but how? Speculation and fan-theories abounded, and writer (and frequent Twitter dweller) Mark Gatiss playfully toyed with the viewer by presenting the hilariously ludicrous Derren Brown solution. 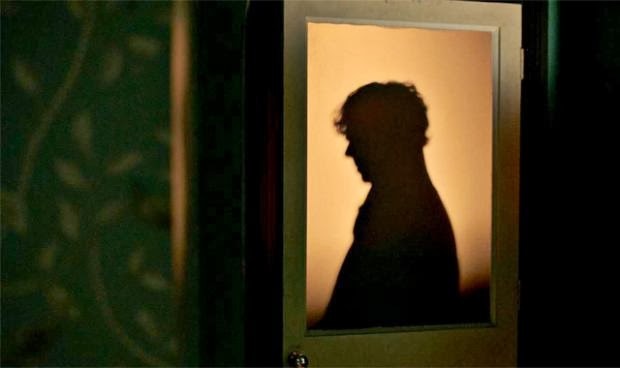 Of course, this – along with the vision of Sherlock and Moriarty chucking a Sherlock-shaped dummy from the roof before going in for a fan-squealy smooch – was knowing, mischievous devilry from Gatiss and fellow Sherlock evil-genius Steven Moffat. The Empty Hearse starts series three of Sherlock with a cocky, confident, witty and very cheeky hour and a half of pure entertainment. 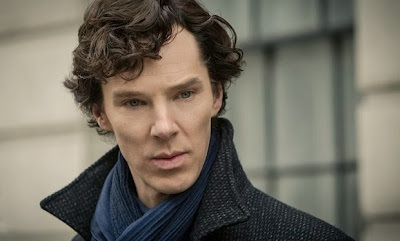 After spending the last two years dismantling Moriarty’s secret network, Sherlock decides to reveal his continued existence to a heartbroken John just as he is about to propose to girlfriend Mary. John doesn’t quite give Sherlock the open–armed welcome he was expecting and the scenes – from swanky restaurant to kebab house – showing John’s increasing frustration at Sherlock’s insensitivity are both laugh-out-loud and poignant. The following cleverly intercut scenes of Sherlock solving unexciting cases while John treats a succession of dreary ailments at his medical practice positively bristle with fun in their “monkey gland”/”piss pot” dialogue. There are some great acting treats in The Empty Hearse, from Martin Freeman’s real-life missus, Amanda Abbingdon as John’s fiancée Mary to Benedict Cumberbatch’s real life parents Wanda Ventham and Timothy Carlton as Sherlock’s parents off to a theatre trip to see Les Mis. Mark Gatiss’s Mycroft Holmes making an impassioned plea for Sherlock to take over parental baby-sitting duties during the interval is a joy in the midst of a script chock-full of delights. The standard of acting from Cumberbatch and Freeman and Sherlock and John is a thing to behold. They inhabit their respective roles with such ease, that’s it’s easy to take for granted the pure class they bring. It’s not hard to see why Hollywood (and Peter Jackson) came a-calling for these two. It’s also a testament to both men that they’ve come back to the world of BBC budgets, though granted, complete with world-class writing and production. Underpinning all of this is a jolly exciting romp of a plot where a rogue Lord plans to bomb Parliament on 5th November. This culminates in a ticking time bomb that Sherlock has to diffuse without having the first clue how to diffuse a bomb. Given just how much story is crammed into The Empty Hearse, it’s inevitable that there’s enough mystery and plot left over for the next couple of episodes, number two of which features John’s wedding to Mary.